View Tameson’s range of pneumatically controlled butterfly valves, which are used to control the flow of a media remotely. They can have either a lug or wafer connection style. Based on the actuator design (single or double acting) the actuator will open and close the butterfly valve with compressed air (single acting uses a spring to either open or close the valve). 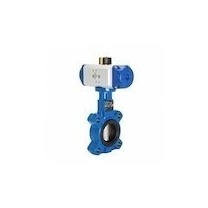 The butterfly valve has a disc that rotates with the actuator to open or close the butterfly valve. The butterfly valve design allows for good sealing properties, durability, and reliability for your application. Pneumatic actuators are a reliable solution and often used to control larger valves than electric actuators at a lower investment cost. There are various housings, seals, and sizes of pneumatically controlled butterfly valves to allow you to find the right one for your application.